Many of my fellow cat lovers look after our feral cat population because it is the right thing to do. 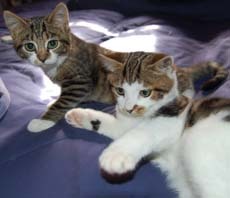 Jessie-Jane and Michael are examples of feral cats that live at Cat Palace USA. We found them in a neighbors barn in the dead of winter and adopted them as part of our family. Both cats have gotten out of the house and had to make their way all alone outside. Remember feral cats are usually afraid to approach people and just live in the wild. Jessie-Jane left in May and to my surprised returned in November through the cat door. Michael did the same in September and returned in January. Winter is not far away and one should consider purchasing an outdoor cat house so your local feral cats will be protected from the winter cold, rain and snow. Just remember, our feral cats need our love and help, just like our indoor feline friends.